Harry Morgan (John Garfield) dreams of running a successful fishing boat rental business, complete with a whole fleet of boats. Currently, he only owns one boat and is barely making enough money to make the payments on it and take care of his wife Lucy (Phyllis Thaxter) and their two daughters. It’s putting a terrible strain on Harry and Lucy’s marriage and Lucy desperately wants him to give up this idea and go work on his father’s farm, but he refuses. One day, Harry is hired to take Hannagan (Ralph Dumke) and his girlfriend Leona (Patricia Neal) fishing in Mexico. While in Mexico, Hannagan leaves Leona behind and without paying Harry for his services. Now truly desperate for money, Harry takes a job offered to him by Duncan (Wallace Ford), who often tries to recruit him for shady jobs. This time, Harry is asked to smuggle Chinese workers into the country illegally. Harry isn’t happy about having to take this job and tries to protect those close to him like his friend Wesley Park (Juano Hernandez) and Leona, who he has become attracted to, so they won’t be involved. And he certainly doesn’t want Lucy to know what he’s up to, although it doesn’t take her long to realize something is wrong and to hear that he’s been spending a lot of time with Leona. It gets harder and harder to keep his new “job” a secret, especially after Harry gets into a tussle and kills a gangster who tries to rip him off. Harry runs into problems with his boat being confiscated, which gets him even deeper in with Duncan after Duncan helps get the boat back so Harry can do more work for him. This time, Duncan wants Harry to help some gangsters escape after a robbery. Once again, feeling like he has no other choice, he takes the job but comes up with a plan to turn the tables. 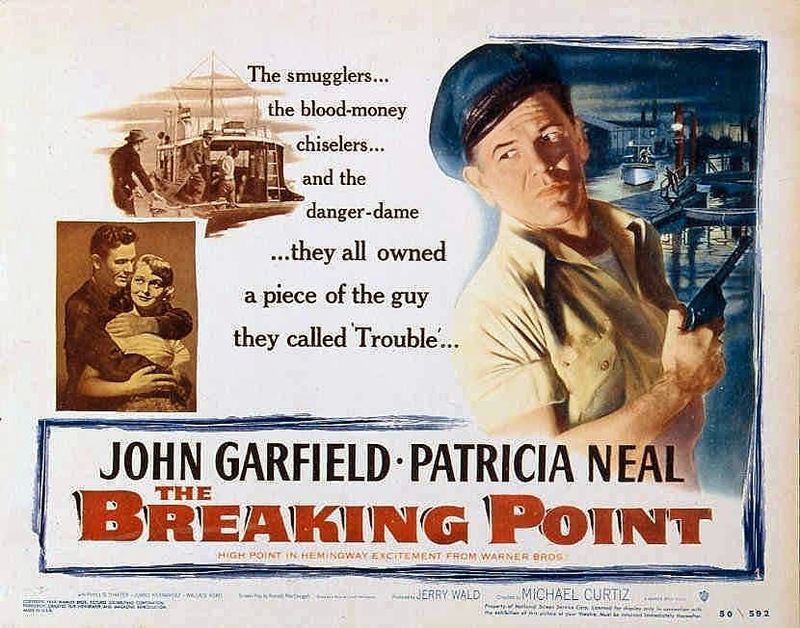 The Breaking Point is film adaptation of Ernest Hemingway’s To Have and Have Not. 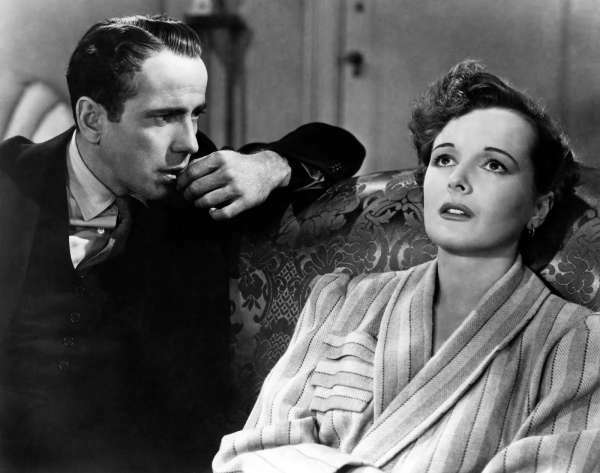 Although the version starring Humphrey Bogart and Lauren Bacall, which came six years earlier, is by far the more famous version, The Breaking Point is much more faithful to the source material. (As great as To Have and Have Not is, nobody even bothers trying to argue it was a faithful adaptation of the book.) The Breaking Point is hugely under appreciated. John Garfield, Patricia Neal, and Phyllis Thaxter are all excellent. It’s very raw and gritty with a powerful ending, very much in line with the signature Warner Brothers style. The screenplay is fantastic and it certainly doesn’t hurt that it had Michael Curtiz at the helm as director. The only reason I can imagine as to why it isn’t a more well-known movie is that it’s overshadowed by To Have and Have Not. (I’m not trying to speak ill of To Have and Have Not; I’m very fond of both movies.) Keep an eye out for this one, you won’t be disappointed. Posted in 1950s, Blogging Under the Stars, Crime Film, Dramas and tagged John Garfield, Juano Hernandez, Michael Curtiz, Patricia Neal, Phyllis Thaxter on August 17, 2015 by Angela. Happy March! 31 Days of Oscar may be coming to an end, but there are still plenty of other great things to look forward to in the upcoming month. What I’m most excited to see returning to TCM is Carson on TCM! You may remember that back in July 2013, TCM aired a number of classic Johnny Carson Tonight Show interviews with stars such as Doris Day, Kirk Douglas, George Burns, and Bette Davis. 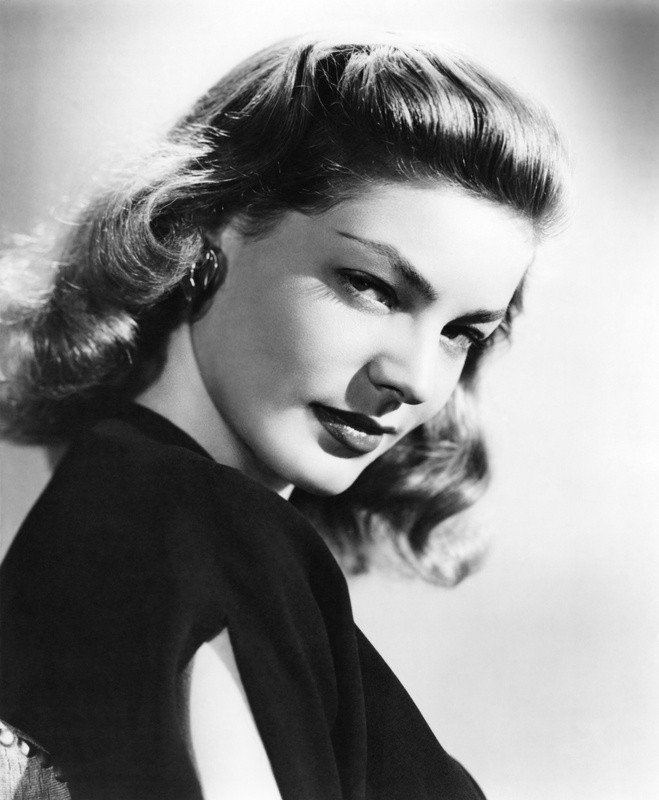 This time around, we have interviews with Gene Kelly, Lauren Bacall, Bob Hope, Jack Lemmon, and Gregory Peck (just to name a few) to look forward to. I absolutely loved watching the interviews back in July, so I’m very excited to see more. After taking a break last month for 31 Days of Oscar, Friday Night Spotlight returns with a series about Food in the Movies selected by Anthony Bourdain. Posted in TCM and tagged Betty Compson, Eva Marie Saint, Goldie Hawn, John Garfield, Lauren Bacall, Mary Astor, Red Skelton, William Powell on February 27, 2014 by Angela. Posted in TCM, Uncategorized and tagged Ann Sheridan, Bette Davis, Edward Everett Horton, Greer Garson, Joel Grey, John Garfield, Kim Novak, Lionel Rogoson, Martin Ritt, Roberto Rossellini, W.S. Van Dyke, Warner Baxter on February 27, 2013 by Angela. Happy September, everyone! I hope you all enjoyed this year’s edition of Summer Under the Stars. One good thing may be coming to an end, but fear not, there are some very, very cool things to look forward to in September. Silent film fans, rejoice! Every Thursday night this month, TCM will be spotlighting movies produced at Mack Sennett studios, which means there will be tons of silent films being played during prime time. 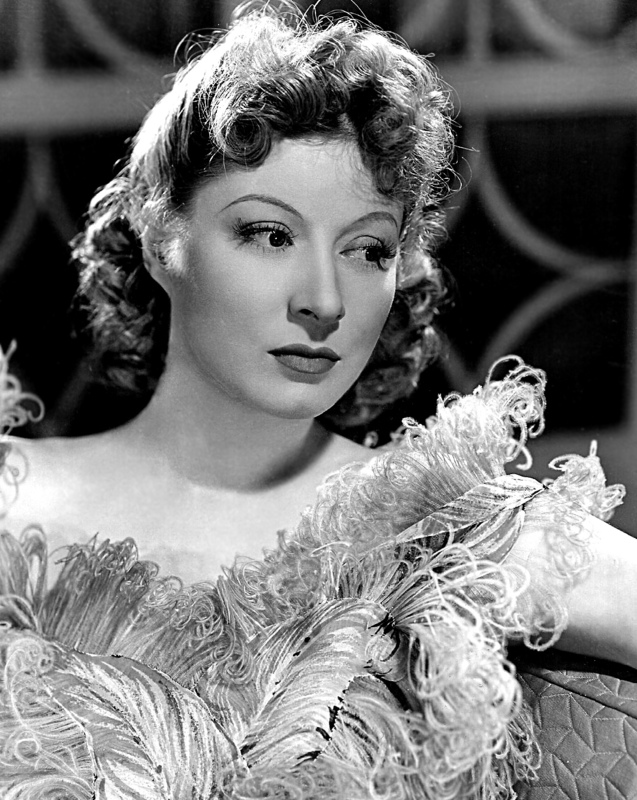 83 short films will be included in this tribute, the vast majority of which have never been shown in TCM before, and will feature stars such as Charlie Chaplin, Mabel Normand, Fatty Arbuckle, and Gloria Swanson. I, for one, am very excited for this! A few months after the events of 1938’s Four Daughters, things are as lively as ever at the Lemp household. All of Adam Lemp’s (Claude Rains) daughters all come back home to help out with his spring cleaning, but they all have other things on their mind. Emma (Gale Page) thinks she might be expecting her first child and Ann (Priscilla Lane) is now engaged to Felix (Jeffrey Lynn), who has just returned from a concert tour. However, the mood changes when Emma finds out she isn’t pregnant and will probably never have children. Ann, on the other hand, is pregnant, but Felix isn’t the father — her recently deceased husband Mickey Borden (John Garfield, footage of him from Four Daughters is used in flashbacks) is. Everyone thought Ann had moved on from Mickey, including Ann herself, but news of her pregnancy has stirred up a lot of feelings in Ann. All she can do is think about Mickey and his music. She can’t stop feeling guilty about the tragic nature of Mickey’s life. Kay (Rosemary Lane) is worried about her sister and asks Doctor Clint Forrest, Jr. (Eddie Albert) to have dinner at the Lemps’ home that night so he can give Ann some advice. Well, that and Kay wants to date Clint. Clint’s best advice to Ann is to move on with her life and not let this tie her to the past. She takes his advice to heart and decides to quietly elope with Felix. Thea (Lola Lane) hosts a dinner party for the newlyweds, but also has some news of her own — she will be adopting a baby! Even though Ann wants to move on with her life, it’s really hard for her when Felix decides to finish an unfinished piece of music Mickey had written and she breaks down during the party. The ghost of Mickey continues to come between Ann and Felix, and they get into a big fight just before Felix is to leave on another tour. Just as he’s about to leave, Ann goes to the train station to stop him, but not only does she miss his train, she starts to go into premature labor. Four Daughters was one of my favorite discoveries during last year’s Blogging Under the Stars, so naturally, I was very eager to see Four Wives this year. 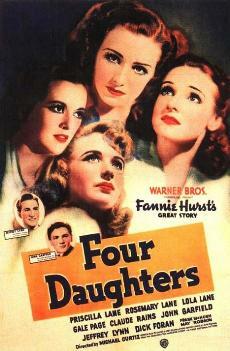 Four Wives wasn’t quite as good as Four Daughters, but it is a pretty decent sequel nonetheless. 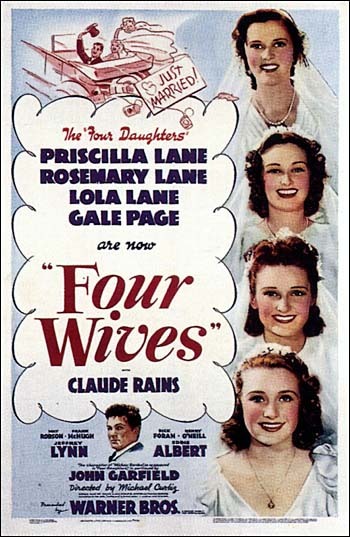 Claude Rains was still perfect as the Lemp family patriarch, but Priscilla Lane proves to be the strongest link in Four Wives. I’ve really been becoming a big fan of Priscilla Lane lately and her performance here makes me think she is very underrated as an actress. The strength of her performance really carried the movie through a sometimes-weak screenplay. Ann’s storyline is pretty compelling, but the subplot about Thea’s adoption process was completely ridiculous and pushed my ability to suspend disbelief to its breaking point. 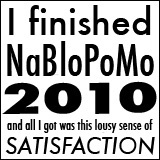 Plus it is a bit heavy-handed on the sentiment. But, even for its faults, I still really enjoyed the movie and I’m looking forward to seeing the other sequel Four Mothers sometime. It’s a really enjoyable film series, I’m not sure why it isn’t better remembered today. The Lemp family is a family of musicians. Adam (Claude Rains), the family patriarch, is a music professor and his daughters Emma (Gale Page), Ann (Priscilla Lane), Kay (Rosemary Lane), and Thea (Lola Lane) are all talented musicians as well. But despite all the talent the daughters have, Kay is the only one truly interested in pursing a career in music. Thea has her sights on marrying Ben Crowley, who she is only marrying for his money. She swears up and down that marrying for love is overrated, but we soon see that she’s having a hard time making herself believe that. Emma has been seeing a guy named Ernest, but doesn’t appear to be in any rush to get married. Then there’s Ann, who just doesn’t get the appeal of marriage and makes a pact with Emma that neither of them will ever get married and they’ll be a couple of old maids together. Ann starts singing a different tune when she meets Felix Deitz (Jeffrey Lynn), a young composer who has come to town for a music competition. All the girls in the family have a bit of a crush on Felix, but Felix and Ann quickly fall in love with each other. Things get even stickier when Felix’s friend Mickey Borden (John Garfield) comes to town to help him work on his music. Mickey’s a pretty rough guy, but Ann realizes he’s not a bad guy underneath it all. She manages to break through his tough exterior and a mutual attraction builds between the two of them. But despite her new attraction to Mickey, she accepts Felix’s marriage proposal. When Mickey hears the news, he’s heartbroken and tries telling Ann that he thinks Emma is in love with Felix. She doesn’t believe it at first, but on the night before their wedding, Ann spies on Emma and Felix through a window and worries that Mickey was right. After giving it some thought, Ann decides the best thing she can do is marry Mickey instead and let Emma have Felix. Mickey and Ann move to New York, but married life isn’t everything they thought it would be. When they go back to the Lemp homestead for Christmas, they find Felix is also visiting for the holiday. Ann also finds out that Emma is engaged to Ernest, not Felix and Mickey realizes that there are still feelings between Ann and Felix. Feeling guilty for what he’s done, Mickey offers to give Felix a ride to the train station and on the way back, drives into a tree. Mickey doesn’t survive, but a few months later, Felix comes back to start again with Ann. Four Daughters is the kind of movie that made me glad I decided to make myself watch something new every day during Summer Under the Stars this year. I don’t know if I would have watched it if it weren’t for this scheme, but I am so happy I did watch it. Even though this was nominated for a Best Picture Academy Award, it’s not a very talked about movie and that’s really too bad because it’s fantastic. I loved the writing, it’s got plenty of drama but it’s also got just the right amount of humor. The cast is just top-notch. Claude Rains made the perfect patriarch, Jeffrey Lynn was totally endearing, and John Garfield was a flawless choice for the part of Mickey. Four Daughters was actually John Garfield’s first movie and he earned a Best Supporting Actor Oscar nomination for his performance. I just loved every minute of it. If you’ve never seen it before, keep an eye out for it on TCM. It’s one of those totally underrated gems that really delivers. Posted in 1930s, Blogging Under the Stars, Dramas and tagged Claude Rains, Gale Page, Jeffrey Lynn, John Garfield, Lola Lane, Michael Curtiz, Priscilla Lane, Rosemary Lane on August 6, 2011 by Angela.